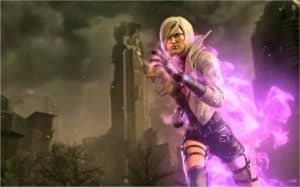 Phantom Dust Remake Could Release Before E3 2017 | Nerd Much? If Phil Spencer gets his way, we could be playing the Phantom Dust remake before E3 2017. That would certainly be a surprise release after hearing so little for so long. Spencer took to Twitter to tease the Phantom Dust remake’s upcoming release. “We’d like to have you playing before E3 this year,” he said. This is welcoming news after the recent cancellation of Xbox One exclusive Scalebound. Phantom Dust released almost twelve years ago on the original Xbox. This unique game has since built a cult following. As a mix between a third person shooter and a card game, there has never been a game quite like it. Up to four players could compete against one another as character use dust as a weapon. The remake was first announced at E3 2014, but little has been revealed since then. During E3 2015, Microsoft announced that the game was no longer in active development, but was still being worked on. No information has been given as to how this remake will play. Releasing the Phantom Dust remake after such a news drought would be a huge deal for Microsoft. If they are really doing this, we should expect a trailer within the coming weeks.